Harry’s musicality offers extraordinary range and depth: from his soothing Hawaiian slack key and steel guitar renditions, to the intricacies of classical guitar, to soulful rock ballads or the blistering riffs of classic rock, Harry’s fluid guitar playing and resonant voice seamlessly transports his listeners across cultures and styles. Find out more about Harry, or about the music he’s made over the years. 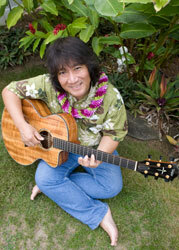 He offers guitar and ukulele lessons, and also performs live at many venues throughout the island of Oahu. Join Harry’s mailing list to stay updated on all his performances. Visit the music page for more about Harry’s music, and more sample tracks.